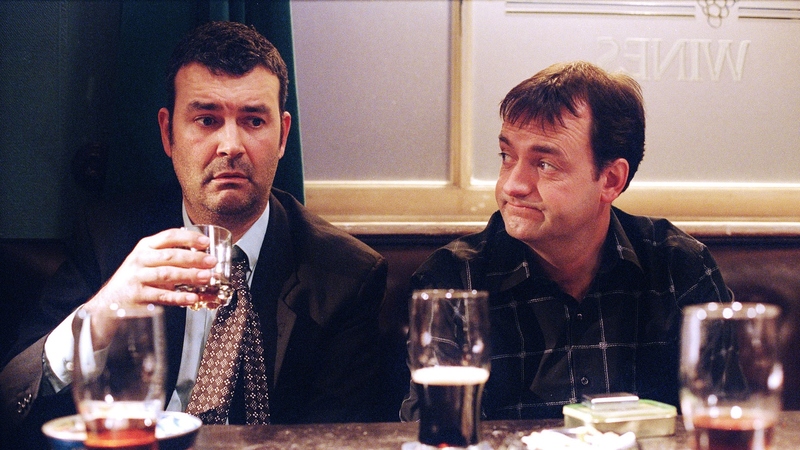 Early Doors was the next “people sitting around talking and nothing happening” sitcom co-created by Craig Cash after The Royle Family, this time with Phil Mealey. It is set entirely in the Stockport pub The Grapes, and follows landlord Ken, his family (work-shy mother and student daughter) and his wider family, the pub’s regulars. It ran for two series of six episodes each on BBC Two in 2003 and 2004. Early Doors is another of the series that was well-regarded at the time, but has perhaps become a bit obscure since, being overshadowed by the return of The Royle Family for interminable Christmas specials. That said, it occasionally pops up as a repeat on BBC Four. While the talky bits are full of quick, but very dry, Northern humour, the series is given an extra dimension by a number of through-line plots over the course of each series. These were added, according to the DVD commentaries, on the advice of Nicola Shindler and rather against the instincts of Cash and Mealey who wanted to stick to the droll talky stuff. The understated plotlines about Ken’s daughter tracking down her real father (series 1) and the threatened closure of the pub and possible romance for Ken (series 2) give the show a weight that makes it all the more watchable and effective. The cast are of course also excellent throughout (so much so that a couple of them, James McAvoy and Maxine Peake, were poached by Shameless between series). It’s a show that does a particularly good job of creating its own world for the viewer to revisit: warm and funny, but not without its rough edges. Some aspects of the show are down to taste: it’s very Northern, and the business of people sitting around talking and nothing very much happening (or at least not very obviously or quickly) probably limited its appeal. Those who liked it, however, undoubtedly really liked it, and it’s included here in the hope of nudging it to keep alive in the memory for a bit longer rather than because it got any particularly raw deal at the time. Both series are available on DVD. Much better than The Royle Family in my opinion. My opinion is as worthless or as valid as anyone else’s, but I believe that ‘Early Doors’ is one of the finest examples of the comedy of kindness ever broadcast on British television. Possibly the best comedy ever produced, brilliant. Yes, Ezzmond, I think Craig Cash and Shane Meadows should get together too, but I also think the former is SO overrated. Why would the latter bother? Couldn’t agree more. I am trying to explain to my bro why I prefer Early Doors to the Royle Family (he’s a Family man through and through) and it is the difference of the plots introduced by Nicola Schindler which give it the setimental ooomph. Both are far and away better than Sunshine, another Craig Cash exploit which is like a shire horse of sentimentality with a saddle of Northern humour. It sadly undermines itself due to the schmaltzy approach to a serious topic despite the all star cast (basically everyone in Early Doors and Steve Coogan). I think Craig Cash and Shane Meadows should get together and do a gritty yet loveable Northern comedy!